The Asháninca, indigenous people living in the rainforests of Peru, are known historically to be fiercely independent. Today they are kidnapped by the guerilla and have to face "modern slavery“. Many of them are children who will never see their families again. “I was eight years old when Shining Path took me”, says the woman, who doesn’t reveal her name because she’s still afraid of this maoist Peruvian guerrilla. She is now 38, so she had been for three decades in the hands of this armed group, before she and other 53 people, 34 of them children and mainly Asháninca indigenous, were rescued in two actions during the last week of July by a special antiterrorist squad formed by the Police and the Army of Peru. In a brief talk with journalists, she doesn’t go into details about her captivity. She only explains, through a translator, that she used to get up at dawn and had to cook for the children of her “productive forces” (as Shining Path called them) camp. This was hidden in the forest of the only area where the guerrilla has a presence. “I didn’t have joy. I was very afraid of being murdered”, she explains. During the eighties and beginning of the nineties, Shining Path was a vigorous guerrilla which challenged the Peruvian government in an attempt to seize power. One of their main bastions was the hilly and forested Valley of the Rivers Apurimac, Ene and Mantaro (known as VRAEM), inhabited mainly by Ashánincas. When the guerrilla men arrived to the valley, in the early eighties, some ashaninkas welcomed them, as they scare off the colonists that had been for some years occupying their ancestral lands. In addition to this, they promised to the indigenous wealth and prosperity. But the dream that the Path had promised soon began to become a nightmare, as these foreigners aspired to control every single aspect of their lives, they punished and even killed anyone who opposed them and of course the welfare they had promised didn’t arrive. In the Asháninca villages beyond their control, they used “to make raids, get into the schools and pick the smartest to kidnap them and infuse their ideology”, explains Leslie Villapolo, from the Anthropology and Practical Application Amazonic Centre (CAAAP), who worked in the region during that period. The worst came in 1991, when the army, aided by Asháninca people, began the recovery of the valley and Shining Path forced the neighbours of the villages under their control (around 45) to withdraw to the mountains. With new false promises of a “New State” they took with them around 5,000 Ashánincas to use them as their “productive forces”. Once in this “New State”, the control over the Ashánincas became more severe, as they knew that the deserters would give valuable information to the army. “They use the strategy of the Khmer Rouge (in Cambodia): They separate the families, sending the father to one camp, the son to another, and so on… This way they threatened to kill the other members if one of them tried to escape, and indeed they used to do so”, says the general commander of the VRAEM Special Squad, César Astudillo. The captives were forced to produce food for the guerrilla and the hard living conditions caused many deaths from underfeeding and communicable diseases, indicates Villapolo. Besides, “women were separated from men and Shining Path chiefs could choose any woman to be their concubines”, she adds. After the capture by government of Shining Path leader, Abimael Guzmán, in September 1992, he declared the rendition, but the armed group split and one branch disobeyed and kept fighting, including those in the VRAEM. They were increasingly weaker and moving in the jungle with the Asháninca captives reduced their mobility. So, tells Villapolo, “they told them to go back to their villages to farm so they could go from time to time to ask them for food”. However, they kept some of the captives and those who haven’t died, escaped or been rescued have been enslaved so far. Peruvian Deputy minister of Politics for the Defence, Iván Vega, estimates there are still in clandestine camps under the guerrilla control around 80 children and 100-120 adults. “Shining Path has this people in slavery. They used them for provisioning. Young women are raped to have children, future guerrilla men. When these children are 13 or 14 years-old guerrilla comes, takes them and leaves”, Vega deplores. Peruvian army and police get to know, from a deserter, there were several of these people in some camps disconnected from those where guerrilla fighters (decreased nowadays to 60-80 people, according to head of National Police Antiterrorist Bureau, José María Baella) and chiefs are. They were two camps with more than fifty people in total, guarded only by a man with a rifle each, but they didn’t dare to escape because they feared retaliation if caught. Besides, some of them still have relatives in other camps or in the guerrilla and the chiefs had convinced them that if the soldiers got them, they would be tortured and killed. “Shining Path leaders brainwash these people and tell them: ‘If you see a soldier, run because he is going to harm you”, Vega claims. For months the security forces tried to rescue them, but when they get closer the captives run away. So they have to devise an strategy to convince them that they wouldn’t be hurt: they left food and clothes in the camps, also leaflets with pictures of other people rescued and messages in Spanish and Asháninca inciting them to leave the jungle and a letter from a woman who had been freed one year ago and had relatives among the captives. When they decided to turn themselves in and were pulled out the jungle, they were undernourished, wearing rags and full of lice and parasites. They were taken to the regional police and accommodated in a bunkhouse where children saw for the first time a TV set and toys such as a plastic ball, and where they wear their first shoes. Now a difficult re-adaptation process awaits them. The rainforest in Peru is the home for the Asháninca. 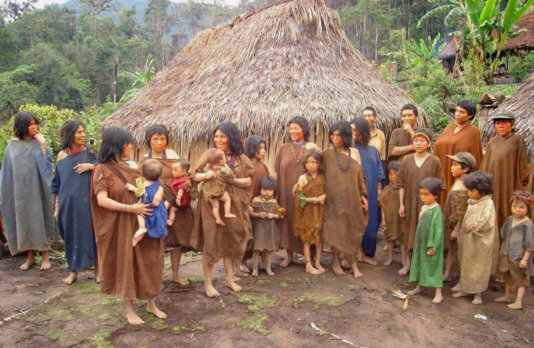 53 Asháninca were rescued from peruvian guerrilla by the Police and the Army of Peru. Peruvian President Alberto Fujimori shakes hands with one of the leaders of the Shining Path guerrillas, who are responsible for the enslavement of the Asháninca.